Stupendemys is just, well, stupendous. 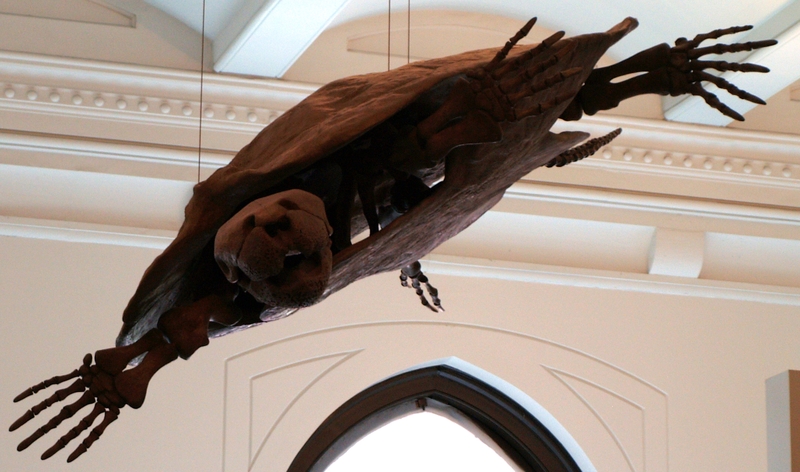 Even after encountering a ceiling-suspended specimen at the American Museum of Natural History, the ground-level replica at the Harvard Museum of Natural History came as a shock. 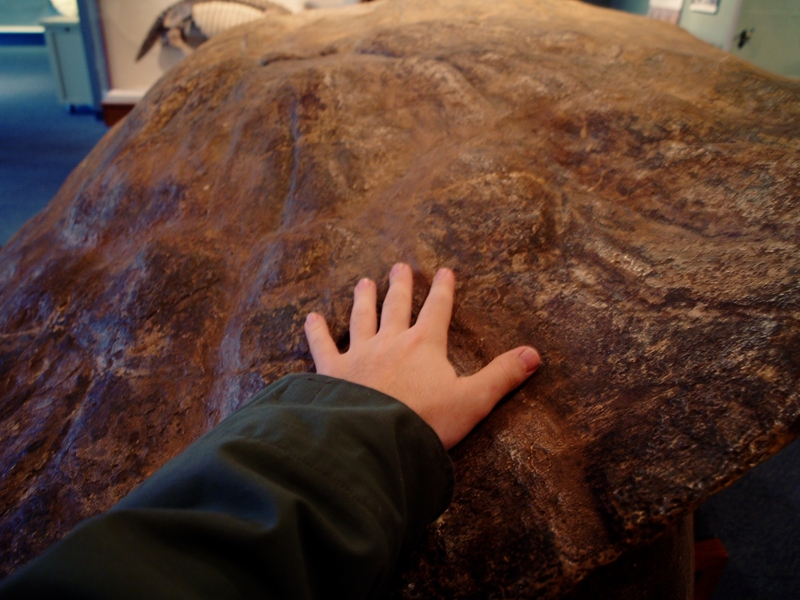 Of course, part of this shock was due to having no idea there was even a replica at the museum, wandering off to see ‘Plasterosaurus’, and then coming face to scutes with a hunk of shell about the size of a dining room table. 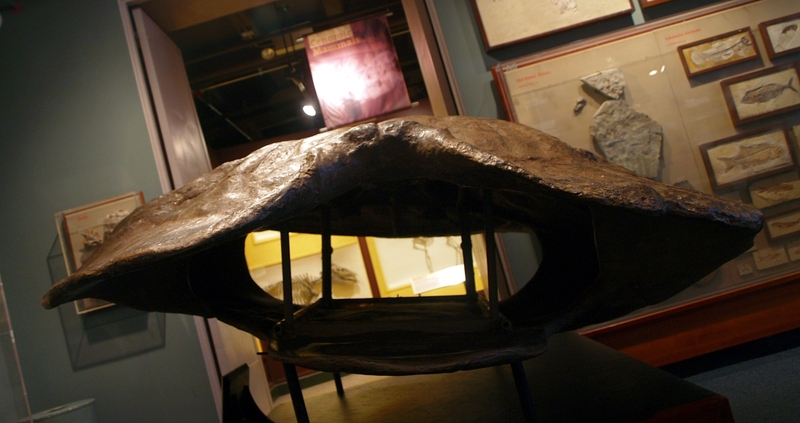 The AMNH and HMNH carapaces appear to be replicas of MCZ(P) 4376, which has a strait carapace length of 2.18 meters (~7’2″) (Wood 1976). 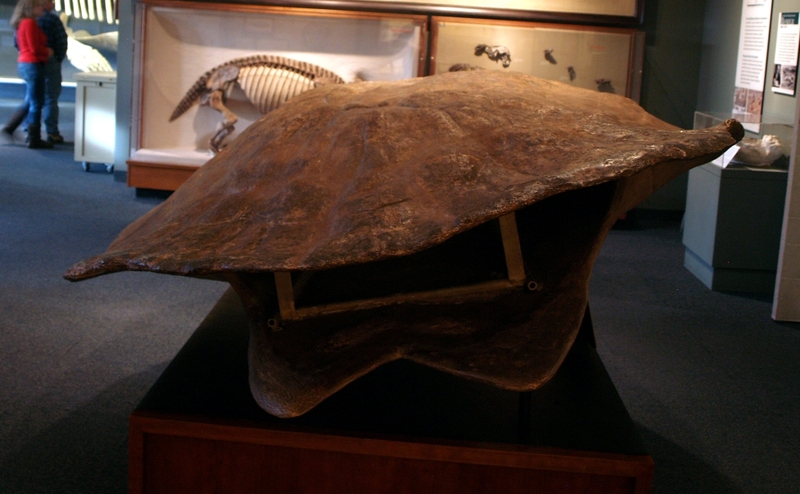 Despite almost being large enough to inhabit, this shell appears to be on the small side for Stupendemys geographicus. Wood estimated another specimen to have an SCL of 2.30 m (7’7″), Bocquentin and Melo (2006) mentioned a 3.18 m (10’5) SCL specimen, and Scheyer & Sanchez-Villagra (2007) sampled two, one which was ~2-3 m (~6’7″ to 9’10”) in SCL and another which was 3.30 m (10’10”) with a carapace width of 2.18 meters. It’s almost beyond belief that the turtle body plan would still be functional into the multi-ton range – I’m especially curious how egg laying was accomplished – but I suppose stranger things have happened. Stupendemys is remarkable for reasons other than being about the size of a compact car. 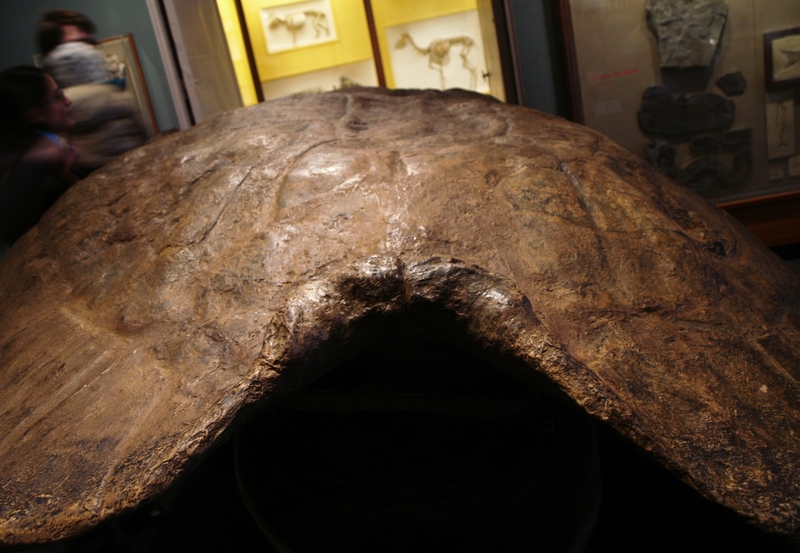 At the anterior end of the carapace is a thickened and upturned ‘collar’, apparently unique among turtles (Wood 1976). Wood examined two S. geographicus specimens, and as one (pictured above) had a more developed collar, he speculated that it may be a secondary sexual characteristic. The other Stupendemys, S. souzai, has a collar which is developed to a similar degree but is vertical rather than curled back (Bocquentin & Melo 2006). Bocquentin & Melo speculated that S. souzai would not have been able to inhabit areas with swift currents and would have been restricted to swamps and small streams; the authors also curiously imply that S. geographicus was marine due to its association with the turtle Bairdemys. Whether or not S. geographicus is marine still appears to be an open issue (Sánchez-Villagra & Scheyer 2010); I feel obliged to point out that ostensibly “freshwater” turtles wandering around in marine settings are not uncommon… but that’s a story for another day. Underneath the collar is a deep median notch which, owing to comparisons with the distantly related Platysternon, Wood took as evidence that Stupendemys had a similarly large, non-retractile and heavily plated head. Platysternon doesn’t have exclusive ownership of similarly deep notches (also present in some snapping turtles, musk turtles, seaturtles, et cetera) and among the much closer relatives of Stupendemys (also members of Podocnemididae) Erymnochelys and Peltocephalus have big heads and prominent but comparatively shallow notches. I see no reason to think that Stupendemys had a radically different approach to neck retraction than other side-necked turtles as suggested by Wood, although of course further study of the neck vertebrae and (when found) the skull will be needed before making any conclusions. Despite having no known skull (the above is enlarged Caninemys material), this didn’t stop authors from speculating on the diet of Stupendemys. Wood postulated it was largely or entirely herbivorous due to its size, as he was under the curious impression that the largest living turtles (terrestrial and marine) were herbivorous – was the famous jellyfish-heavy diet of Leatherbacks not known back then? Bocquentin & Melo curiously stated that Stupendemys had the appearance of a “predaceous bottom-dweller” but didn’t explain how they arrived at that conclusion. My own nearly-baseless speculation is that Stupendemys was a generalized omnivore – considering how much growth they had to accomplish, it seems unlikely for them to refuse anything. Then again, Leatherbacks attain huge sizes on jellyfish, so Stupendemys could very well have been up to something completely ridiculous. Bocquentin, J. & Melo, J. (2006) Stupendemys souzai sp. nov. (Pleurodira, Podocnemididae) from the Miocene-Pliocene of the Solimões Formation, Brazil. Revista Brasileira de Paleontologia 9(2), 187-192. Available. Sánchez-Villagra, M. R. & Scheyer, T. M. (2010) Fossil Turtles from the Northern Neotropics: The Uromaco Sequence Fauna and Finds from Other Localities in Venezuela and Colombia IN: Sánchez-Villagra, M. R. et al. (eds.) Uromaco and Venezuelan Paleontology. Indiana University Press. Scheyer, T. M. & Sánchez-Villagra, M. R. (2007) Carapace bone histology in the giant pleurodiran turtle Stupendemys geographicus: Phylogeny and function. Acta Palaeontologica Polonica 52(1), 137–154. Available. Wood, R. C. (1976) Stupendemys geographicus, the world’s largest turtle. Breviora 436, 1-31. Available.